Tourism and nightlife in the suburban parish of St James (a prime area) is centred in Montego Bay, but the parish has other attractions as well. Saint James is bisected by the Nassau Mountain range. It has several wonderful beaches and coral reefs close to the shore. The ominously named Widowmakers Cave is an underwater cavern where barracuda swim. And of course there are the white sand beaches, islands, mangrove forests, and coral reefs of the Montego Bay Marine Park. Inland may be found Cockpit Country, a rugged, forested area with bizarre limestone formations. The Rocklands Bird Sanctuary is the place to go to see the various colourful birds of Jamaica. By Kent Lake is Kensington Metropark, where visitors can go on boat rides or pet farm animals. The AquaSol Theme Park offers entertainment for all ages, with its water slides and reggae bands. 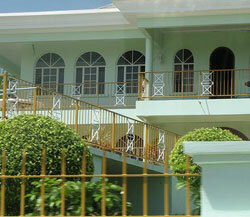 There are also three crafts markets and a number of interesting historic sites in Saint James. The restored Rose Hall plantation house is the most famous site here, especially as it is believed to be haunted. One of the important landmarks in this area is the Old Fort, built in 1774, with its cannon still pointing out to the sea. The Cage, a former jail where runaway slaves were incarcerated, now houses a museum. The old slave ring is still standing as well. The parish church, built between 1775 and 1882, has been restored with slight alteration. Saint James is also known for its excellent golf courses, including the Tryall and Ironshore golf courses. The second largest city in Jamaica, Montego Bay seems to have it all—hip shopping centres, spectacular dive sites, excellent golf courses, gorgeous beaches, historic monuments, an extensive coral reef that was recently declared a marine park, and some of the most attractive new investment properties on the island. The tourist area, which has come to be known as the Hip Strip, is crowded with a variety of stalls. The latest shopping centre is The Shoppes at Rose Hall, which features exclusive brands at low prices. The downtown area has some upscale shops as well. Montego Bay continues to be active at night. The many clubs and bars pulse with the rhythm of reggae, especially during the city’s reggae festival in July, when people party all night as world-famous musicians perform. Of historic note are some well-preserved 18th century plantation manors such as Barrett House, owned by a cousin of Elizabeth Barrett Browning, and Rose Hall, which is said to be haunted by the ghost of one of its owners, the notorious White Witch, Annie Palmer. 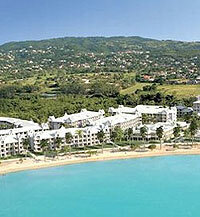 The trendy Rose Hall Resort has access to excellent beaches, shops, and golf courses. An especially attractive housing estate here is Spring Farm, which has beautiful homes and glorious scenery. Town houses are also available nearby, and are becoming increasingly popular. Established areas near Rose Hall have also experienced a resurgence of late. One of these is Ironshore. The infrastructure of Montego Bay is being modernized. It has good port facilities and the famous Cornwall Regional Hospital. Montego Bay is known to be a safe place for tourists.